By the most conservative estimate, as many as 50 of these buildings in the city alone would be destroyed, exposing thousands to injury or death. A cross-section of the city lives and works in them: seamstresses in downtown factories, white-collar workers in Ventura Boulevard high-rises and condo dwellers on Millionaires’ Mile in Westwood. Despite their sturdy appearance, many older concrete buildings are vulnerable to the sideways movement of a major earthquake because they don’t have enough steel reinforcing bars to hold columns in place. Los Angeles officials have known about the dangers for more than 40 years but have failed to force owners to make their properties safer. The city has even rejected calls to make a list of concrete buildings. In the absence of city action, university scientists compiled the first comprehensive inventory of potentially dangerous concrete buildings in Los Angeles. The scientists, however, have declined to make the information public. They said they are willing to share it with L.A. officials, but only if the city requests a copy. The city has not done so, the scientists said. 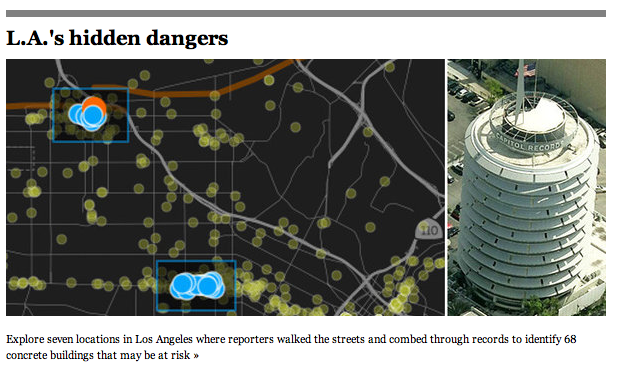 And make sure to check out the Times’ in-depth interactive graphics, which show details on 68 surveyed buildings in seven LA neighborhoods, as well as the mechanics of how a buildings are damaged during earthquakes.